Adaptable and easily transportable, the Aneroid Barometer is also the model for the Altimeter. Here we are at the last stage in the history of the barometer,where solutions were found to the problem of combining strength and accuracy. Barometer, described the invention and development of the mercury barometer, while Part 2 reviewed the less sophisticated but rather attractive Weather or Storm Glass. Barometers measure Air Pressure, and if you want to go back a step you can find plenty of indormation on the What Is Air Pressure? page. Although very accurate, mercury barometers are rather fragile, unwieldy, difficult to transport and potentially toxic, although that wasn't known in the 1600s. So the search was on for an alternative. Around 1700, Gottfried Liebnitz , the co-inventor with Isaac Newton of calculus (my doom in my university years), suggested that changes in the thickness of a hollow disc surrounding a vacuum could be used to measure air pressure, but technology at that time was not up to the task. Things were better in 1843, when the French inventor Lucien Vidie made and developed the Aneroid barometer, the term meaning "without fluid" or"without liquid". Changes in the thickness of the capsule were transferred to a needle on a graduated disc by a system of levers, similar to the banjo barometer developed by Robert Hooke some 180 years earlier. How Does an Aneroid Barometer Work? To be effective, the aneroid barometer needs to be made of a flexible metal of even thickness, sealed with a very accurate weld. Not so easy in the mid 1800s, but not much of a problem these days. The capsule is usually made of thin (0.002 in or 0.05mm) sheets of a copper beryllium alloy, which, after being accurately stamped out, are electron beam welded. This very accurate form of welding is done in a vacuum, which of course is enclosed by the capsule after welding is complete. 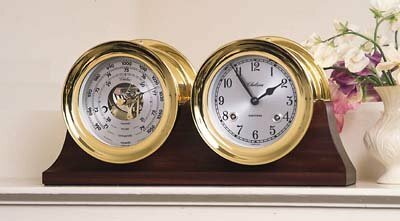 The rest of the process of building the elegant, usually brass cased barometers that are so common today is fairly simple, although the components used vary depending on the accuracy required. We should not forget that the movements as the capsule expands and contracts are very small, so the levers, chains, linkages etc., which magnify the changes and transfer them to a needle on a dial, also need to be very accurately machined, - to the accuracy of a good mechanical watch. The comparison is quite reasonable, even to the use of jewels as bearings. So far, so good. The new barometer is installed in its case, tested and calibrated, and if all is well it is on its way to its ultimate owner. But there are one or two further problems. Firstly the general one of temperature, which will also cause expansion and contraction of the aneroid capsule. 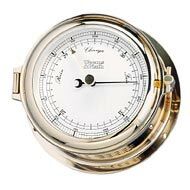 The better barometers compensate for this by including a bimetallic strip which corrects the pressure reading before it reaches the dial. The other problem is altitude compensation. Standard aneroids are designed to work from about 0 to 3000 ft, roughly 1000m, and can easily be adjusted to any height within these limits.Any higher and the barometer will need to be calibrated differently before it leaves the factory. Here's where to go to see a wide range of Aneroid Barometers , including models with temperature and altitudeadjustments. And if you would like to see both state of the art aneroids plus some which have been adapted for use withhome weather stations, Maximum Weather Instruments are well worth investigating. Top quality barometers can usually be found at both ebay (see bottom of page for currently available stock) and Amazon . Aneroid barometers can be designed to perform at greater ranges of altitudes, but as the range approaches a "one size fits all" model, the accuracy decreases. From the sublime to the utilitarian. It's fairly obvious that the barometers built into the receiver/console of the digital home weather station have no room for levers, chains and other linkages characteristic of the traditional aneroid barometer. So the barometer in most home weather stations is just as digital as the other sensors. To achieve this, two metallic strips are built into the aneroid disc or capsule. When an electric current is run across them, their distance apart can be calculated from the charge build up on the plates, or capacitance. The capacitance varies with the distance between the plates, which in turn varies with the expansion or contraction of the capsule as the air pressure changes. Very clever, but not as attractive as the traditional mechanism. Altimeters, literally "height measurers", use the same principle as aneroid barometers, but are calibrated in feet or meters above sea level. They work using the relationship that air pressure decreases by one inch of mercury for every 1,000 ft of altitude, or by about 38 millibars or hectopascals (equivalent to around a 130mb decrease in 1000m), at least over the first 1000 m or so. After that the formula changes because the pressure decrease is not quite even, or "linear". Apart from their use by climbers and hikers, altimeters are still used in surveying, and most notably, in aviation. Commercial and military aircraft also have sophisticated ground seeking radar, GPS and other aids to keep them from flying into the ground, often referred to as terrain clearance indicators. Because air pressure changes both vertically and from one place to another, pilots need to recalibrate their altimeters during their journey, and particularly prior to landing. 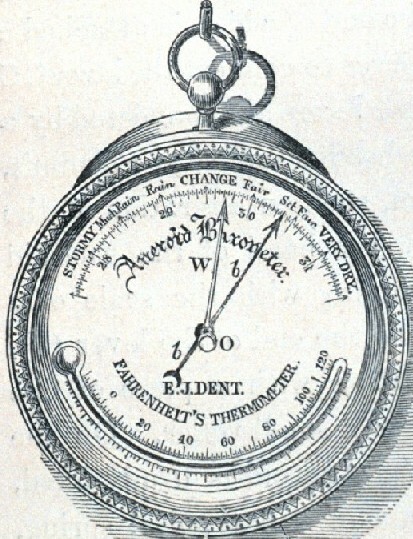 Mercury barometers are still used for scientific and engineering purposes, although they are only a little more accurate than a top line aneroid. Still, they are probably a little easier to maintain and adjust overall. Mercury is also used in the manufacture of replica stick barometers. But the fact remains that mercury is a dangerous element, particularly as a vapor or in combination with other chemicals.It is also very persistent once released into the environment, and can be toxic over time, particularly when absorbed afterregularly eating top predatory fish such as swordfish or marlin. So quite reasonably there have been legislative and voluntary attempts to limit its use. The result in the barometric field is the Eco-celli Barometer, a U-tube filled with a silicon liquid and a gas, combined with a precision methyl alcohol thermometer, plus a scale to allow adjustment of the pressure reading to compensate for temperature variations. It's an elegant instrument, although lacking the mystery of mercury, or the quirkiness of quicksilver. No, it's not named after its inventor. It's named after its occupants. I know that a device has been put together using leeches todescribe air pressure changes, but I'm not entirely certain that leech barometers have been used in any meaningful way. Legend has it that a leech barometer was first made bya French monk from Tours in 1887. Here's what it was and how it worked. Leeches are a form of worm that live in water and wet vegetation. Their sole ambition is to find a warm blooded animal, which they latch on to and, without being detected, help themselves to some of its blood. Not a particularly likeable animal, particularly when you find one on your leg just about when it's drunk its full. Leeches need to stay damp, and they have an inbuilt weather predicting ability, possibly related to pressure changes. So to make your leech barometer, take a jar, part fill it with water, and add half a dozen leeches. During periods of high pressure, the leeches will lazily lie around the bottom of the jar. But when the pressure starts to drop, they become more active, finally crawling to the top of the jar. This makes sense, because low pressure tends to indicate rain, just when leeches like to get out and about. Did I mention that the jar should have a lid? Better go and check! Or maybe frogs would work just as well. Also with a lid. Early History of the Mercury Barometer, and the barometer's poor but good looking relation, the Weather or Storm Glass, can be found by following the links. You can also find information onSetting and Calibrating Your Barometer, and Home Made Barometers elsewhere in this site, together with reviews of Modern Barometers - start with the section on Buying A Barometer. And finally, if you're not quite sure just what those words and numbers on the dial of an aneroid barometer mean, here is a page on How To Use A Barometer. It's not as easy as you might think to use a home barometer for weather forecasting. This link will take you back to the Top, or, when you're ready, here's how to return to the Home page.